Fort Myers waterfront homes and properties for sale are just a click away. 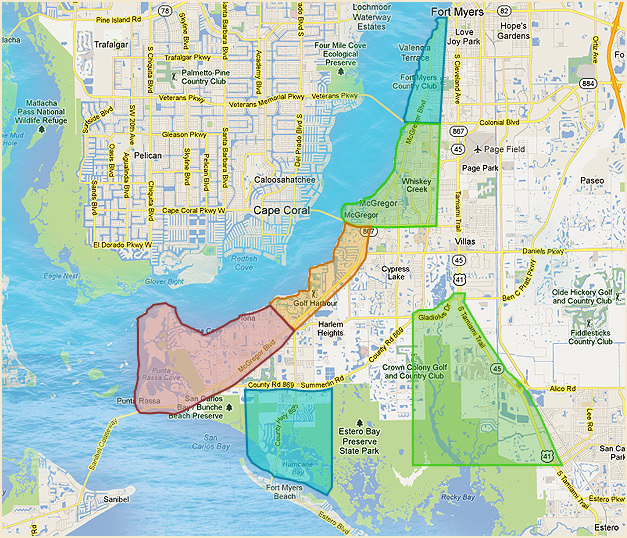 Find your Fort Myers waterfront home or property by selecting a hotlink by geo zone, list price range, or neighborhood. Popular waterfront communities in Fort Myers include riverfront homes, Town & River, Palmetto Point, Palm Acres, Siesta Isles, Gulf Harbour, Jonathan Harbour, St. Charles Harbour, McGregor Isles, Sunset Cove, Whiskey Creek, Iona Rd area, Catalpa Cove, The Harborage, Island Park, and Tidewater Island. Types of gulf access water frontage include river frontage along the Caloosahatchee River, bay, Deep Lagoon, canal, and creek.